Yes, there are real benefits to downsizing your list. Remember the old saying that good things come in small packages? 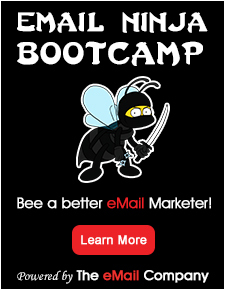 Well, so does better rates of engagement with your email campaign. But, before we dive too much into that I want to be clear that growing your list should still be your priority. List growth is essential for digital marketers. Growing your list is not easy. You have to keep things fresh and constantly gain the interest and trust of website visitors. You need to grow your list using best practices, not shortcuts. Here are a fresh ideas and best practices on growing your email list the right way. • Offer a free digital download which requires visitors to provide an email to download. • Don’t buy data from a list broker, acquire only real time opt-ins. • Create contests on social media which drive them into your website. • Run some social media ads. • Participate in online forms/groups that you can add value to. Having good data collection practices will help you communicate better with your subscribers. It is also recommended that you do a double-opt in campaign as it ensures that the user who provided their email address actually wants to receive your content. Downsizing your email list – Getting back to our main point. Quality is always better than quantity. Just because you have a big list, does not mean you will have big success. Having a large list can be costing you in more ways than one. 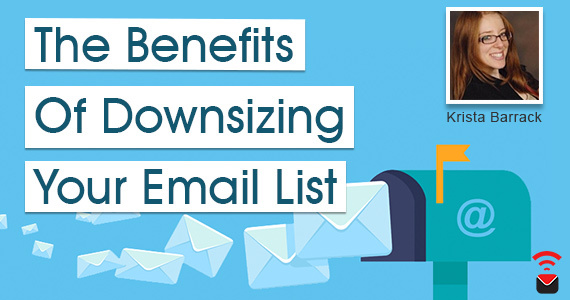 Take a look at our list of ways downsizing your email list can actually benefit your campaigns. 1. Saving you money $$$ – Most of the time email platforms charge you a monthly rate based on the number of subscribers that you have on your list. If 40% of your list never engages with your band what is the point of keeping them on your list? Downsize your list and take advantage of saving money with your ESP. 2. Improve user engagement rates – Once you remove a good percentage of your email list by eliminating disengaged users, your open rates will appear much higher. You will now be able to focus on sending better and more personalized content to a list that is interested in your content. Don’t waste time on users who are not interested in what you have to share. 3. Promotes better inbox delivery – The more opens and clicks each of your campaigns get the more your sender score improves. Your sender score is like a credit score in the world of email delivery. If your score is low your message may not go into the users inbox but instead into their spam folder. When you reduce your list size and improve your engagement rate, boosting your sender score is a potential result. If you have been collecting emails for several months, or several years. Then you first should be running all of your data through email verification. Email verification will be able to identify which email addresses are stale and invalid, and which ones are still active and safe to send to. It will also help you flag and remove high risk email accounts and ones which could cause be malicious to your list. If you want to gauge the data quality in your list, take advantage of XVerify’s free list assessment. The next step would be to identify all of your un-engaged users. Do a look back at the last 2 months’ worth of emails that you have sent. Find out which users have not engaged with any of those campaigns, and remove them from your list. This should be a good starting point to downsizing your list. In conclusion here quality trumps quantity. Run your list through email verification tools to remove poor quality email addresses then identify and remove you dis-engaged users. Once you have made a significant reduction to your list you will notice much improved open rates. You are also likely to see a boost in your sender score resulting in better overall deliverability.